I can’t help but notice that I do write about my travels after it become a distant memory. I have tried several times to do this blog entry right after the trip, but why is it that every time I would, I had reminisced so much that I ended up daydreaming with nothing to put into words. A month had passed and only now that I can write all of these in one sitting. With face mask on and feet up the headboard, here’s what went to my first ever visit to Europe! I’ve been wanting to go to Europe for as long as I can remember but i didn’t think that I’d be visiting Greece first. Probably because there are more mainstream destinations that the media fed us, or could also be because I was initially planning to tick some neighbouring Asian countries first before flying elsewhere. If you’re anything like me who fancies a lot of sightseeing and finding great eats around town, then Electra Palace is also for you! It is located in the heart of Plaka – the oldest district at Central Athens and arguably the most commercialised yet the nicest neighbourhood still. A short walk away are the restaurants and shopping centres. My personal favourite was dining and sitting in at the tavernas. It breathes authentic Grecian culture and vibe. I personally like to take home souvenirs especially from new places I’m visiting. I would recommend buying in Athens because the islands where we went next have tripled prices for the similar items. As I was an Architecture student, I learned that infrastructures and its history says a lot about the country’s identity. I am very much in awe that Greece is still preserving some of their most treasured sites which dates back since 421 BC. If I were a history geek, Athens is most definitely the place to be. Did you know that they came first a thousand years before the Romans? The two civilisation both worshipped gods and goddesses but were very different with regards to beliefs and life values. Ancient Greeks focused on life on Earth and primarily on human’s personality traits – such as Love, Honor, Dignity and Hatred. While Romans, on the other hand, were more focused on actions rather than words. They believed in life after death and even hoped to transcend into a god if they have done well enough in life through bravery and strength in fighting their respective battles. Set in the heart of Mykonos town, this upscale minimalist hotel is worth every penny. A 100m downhill stroll and you are deep into the colourful town. Walking to your room from the lobby feels as if you are in a small greek village. It was smartly designed by not having much of a steep slope for the older people who would be checking-in. Best part is, their breakfast buffet which has a lot of food option to choose from is open from 6 to 11am – perfect for the not-so-morning persons. Have I mentioned that it was still Spring when we went there in May? It was sunny but the wind was really cold! But hey, Mykonos is one of the most beautiful islands that I’ve seen during this season! Flowers were blooming everywhere! Now that I’ve revisited my Mykonos photo album, I suddenly remembered how colourful this island was. It’s such a beauty and the people were so warm and welcoming. My boyfriend and I strolled a bit early during our 2nd Day in the island. We sipped on a hot chocolate and coffee in one of the tavernas facing the crystal clear waters of the beach. It was pure bliss people-watching while waves were gently crashing onto the shore and flock of birds repeatedly danced in the strong wind. But to be fair, everything still went pretty smooth! There was a van that picked us up when we arrived in Santorini’s port , which usually was the case during our entire trip anyway. We arrived at our hotel and WOOWW the view was too remarkable It could already be the destination itself! Located in Fira village, Agali Houses is a 5 star accommodation boasting an awesome panoramic view of the Aegean Sea. Everything was perfect except for the fact that you have to climb up and down the stairs every now and then, which I guess is a normal scene in Santorini. We soaked up some sun in the hotel’s pool area while sippin’ on our cocktails. Being there was more than just a breathe of fresh air. I couldn’t put into words how stunning and serene Santorini was. Whoever started the trend of painting everything blue and white is a genius! 😀 There were a lot of scattered houses, busy hotels and establishments, but it did still look wonderfully organised because of the colour coordination. After we had spent some time at the hotel, we then headed to Oia. It is perhaps the most popular of all villages in Santorini. It was about a 20 minute public bus ride from our hotel. I wish though I had taken the cliffside views while we were on our way, but unfortunately it was crowded that we had to remain standing the whole time. 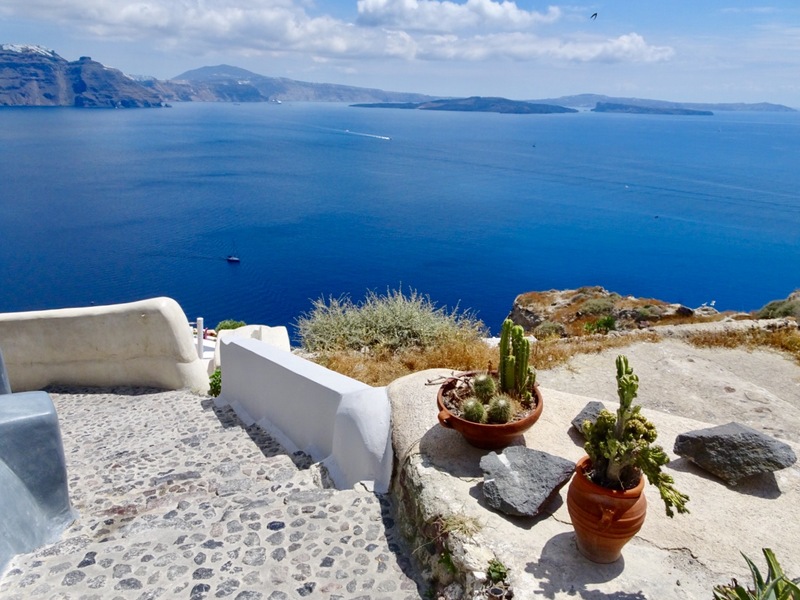 The iconic Blue domed churches, jaw dropping sunset, narrow streets, charming and traditional houses with widely opened verandas are what Oia Village is composed of. Not to mention the picturesque view over the volcano of Palia and Nea Kameni and the island of Thirassia. Trivia: Santorini is a group of islands located in the Southern Aegean Sea. It is actually an active volcano which happens to be a Caldera – A large volcanic craters that was formed by an explosive volcanic eruption. Its last explosion took place in 1950, and although asleep, it still shows numerous minor effusive eruptions. I’d like to thank this whole crew for tagging me along to one of the most memorable trips I’ve had to date! What do you think of Greece during Spring? Considering that there are other 224 inhabited Greek islands, which would you prefer visiting? Comment below if you’ve also been!